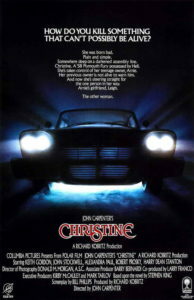 037 – Christine | All Eighties Movies. All The Time! This week we bought a 1957 Plymouth Fury. Nothing can go wrong… right? Join Gidgit and Angry as they share the love all over again for one of their favourite horror movies. Plus it’s directed by the legendary John Carpenter! This entry was posted in Podcasts and tagged drama, horror. Bookmark the permalink. They have done it AGAIN !!! Another favourite from my 80s VHS draw !! The nerd kid from Jaws 2 playing the nerd kid here… cool. The thing is this film ISN’T scary at all, compared to Carpenter’s terrifying (as a kid) The Fog, The Thing and Halloween, this is a picnic with a lairy car, the most frightening thing is Buddy’s hairstyle, but it is über cool. Especially the music. I love RetoCinema but I think my biggest applause to them go to the fact this is REAL 80s films, the big hitters are not here (Yet), no Beverly Hills Cop, no Aliens, no Top Gun, no Back to the Future, no Ghostbusters, I am sure they will be but the fact these are real 80s films for real 80s kids.